Dental implants are a permanent solution to replace one or more missing teeth. A dental implant is a titanium post that is surgically placed in the jawbone to function as the tooth root and support a cosmetic crown, bridge or denture. In addition to improving the appearance of your smile, dental implants restore the functionality of your teeth. 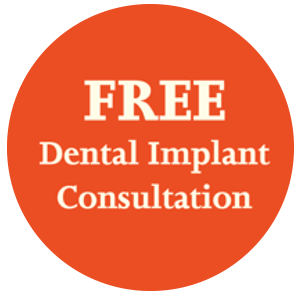 Dental implants are comfortable, durable, convenient, and allow patients to eat, speak, and smile with confidence once again. Dental implants reduce the load on the remaining teeth by offering independent support and retention to crowns, bridgework and dentures. 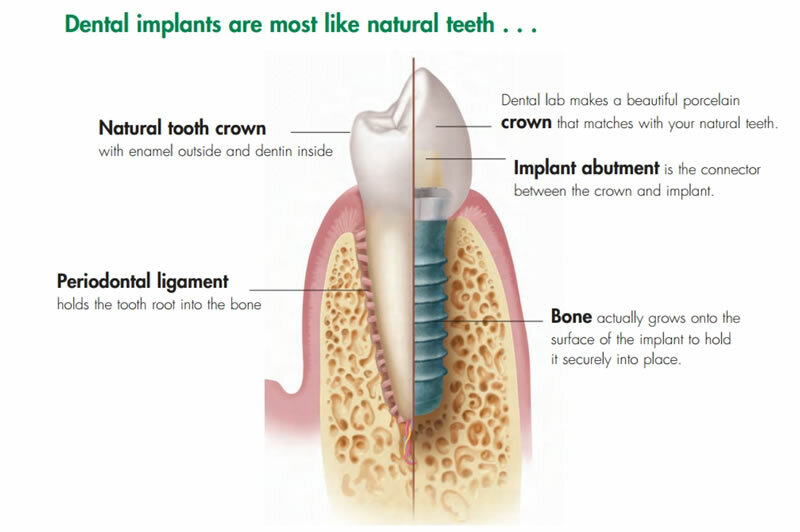 Dental implants preserve natural tooth tissue by avoiding the need to grind down adjacent healthy teeth. Dental implants will preserve bone and significantly reduce bone resorption. Loose fitting dentures can be anchored with dental implants for improved support, stability and retention. 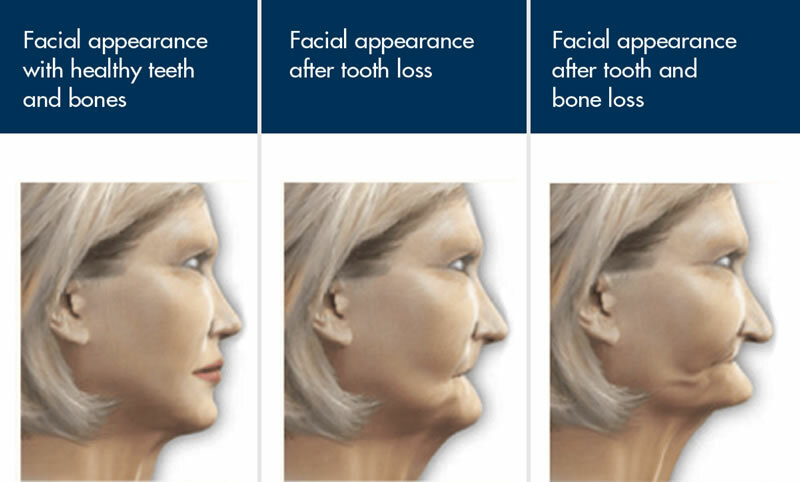 Dental Implants improve facial contours that result in minimizing premature wrinkles. Dental Implants allow you to chew your food better, speak more clearly and smile with confidence. 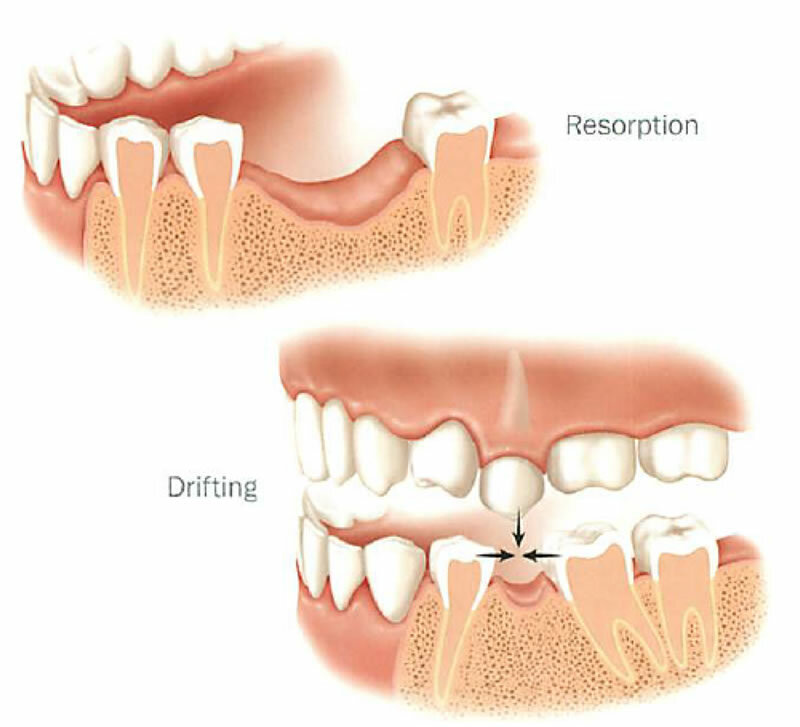 Loss of one or two teeth in a segment of your mouth can lead to drifting of neighbouring teeth, whereby the adjacent teeth lean over into the vacant space where the teeth have been lost. Similarly, opposing teeth can drift down into the open space. As teeth drift, they can adversely affect your bite as well as cosmetics of your face and smile. Discrepancies in the height and contours of the gum tissue may also predispose adjacent teeth to periodontal disease progression an dental decay from accumulation of food and plaque. Once dental implants fuse and integrate into the jaw-bone, they serve both as anchors to support teeth and to prevent jawbone from being lost. A primary reason to consider dental implants to replace missing teeth is the maintenance of jaw bone which helps in making you look younger and healthier. As you may recall, bone needs stimulation to stay healthy and dental implants fuse to the bone, stabilizing and stimulating it to maintain its dimension and density.